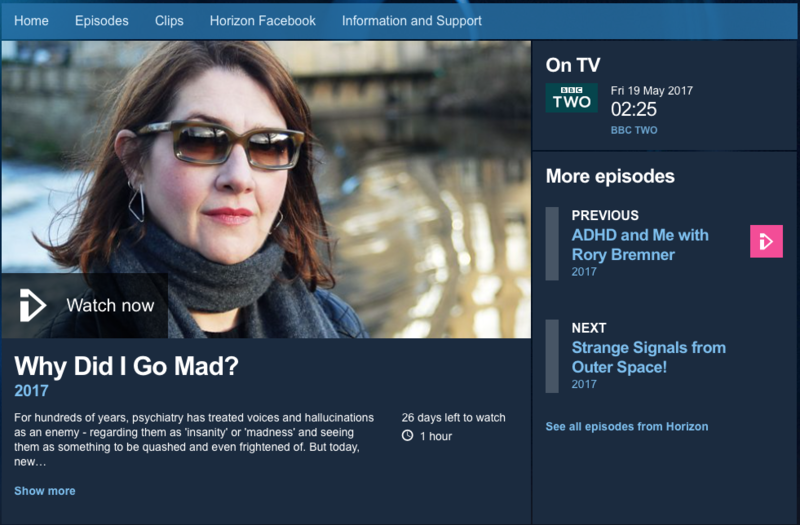 ‘Why did I go mad?’ was the arresting title of a Horizon documentary on the experiences that are sometimes diagnosed as ‘schizophrenia’ or ‘psychosis’ (BBC 2, 2nd May). We were invited into the complex, vivid and sometimes frightening inner worlds of three courageous people who hear voices, see visions and sometimes feel ‘paranoid’, Jacqui Dillon, Rachel Waddingham and David Strange. In fact the title was actually suggested by one of Jacqui’s voices. But before hearing more of their stories, we were taken on quite a long detour around what was billed as ‘the science’. Most of this centred on brains, considered quite separately from their owners, and specifically on dopamine, which appears to be enjoying a comeback in psychiatric theorising. In fact much of the content of the first half of the programme was spliced with updates about this badly-behaved neurotransmitter, which for mysterious reasons sometimes misfires, over-produces, and generally causes its hosts to feel as if they are living in a sinister Banksy-style funfair (cue images of leering clowns, gargoyles etc..) We were told that ‘anti-psychotic’ drugs can keep dopamine over-production under control, although the sight of David counting out the numerous pills that, as a senior psychiatrist frankly admitted to him, are likely to contribute to health problems and an early death, suggested that these benefits are bought at a very high price. We were then shown two new therapeutic possibilities – one in which people are invited to talk assertively to a computer-generated image of their voices, and another in which they keep an electronic diary of the triggers for their voices and visions. While no doubt useful for some, this left the slightly uncomfortable impression that the safest and most ‘scientific’ way of approaching these disturbing people is via a machine. This was, however, balanced with an important glimpse of life contexts from Professor Swaran Singh, who told us about the strong connections between social and racial discrimination and exclusion, and later ‘psychosis.’ Humans are social beings, and the chronic experience of being an outsider is very damaging. The next glimpse of life contexts came from David, tormented for years by visions of giant rats, crabs and armadillos which threaten to ‘eat me alive from the inside.’ What could be going on here? One question from Richard Bentall and it all spilled out. As a young child, David was terrorised by a ‘sadistic, randomly violent’ stepfather who beat him mercilessly. As an adult, he uses exactly the same words, ‘terrifying – frightening beyond belief’, to describe his visions. No one seemed to have suggested a possible link between his stepfather and the giant ‘hairy, dirty’ rats that jumped out unpredictably and threatened to destroy him. And yes, since all human experience is mediated by our biology, raised dopamine levels are probably one consequence of living in this state of permanent fear – but this was a painful reminder of the thousands of people whose metaphors and meanings remain unexplored, and whose traumas remain unresolved, hidden behind diagnostic labels and barely suppressed by drugs. It was only towards the end, paralleling psychiatry’s reluctance to meet the people behind the labels, that we were allowed a direct and precious insight into Jacqui’s and Rachel’s worlds. First, we saw Rachel being supported to dialogue with one of the voices she most fears. She had told us about the abuse she experienced as a child. Now, inviting the voice to speak, she was able to appreciate for the first time what it was doing in her life. It was actually trying to protect her: ‘Tell her that they will hurt her.’ Shaken but relieved, Rachel reflected, ‘I thought the voice meant me harm, but it’s trying to warn me.’ The monster she saw in the mirror aged 7 made sense. ‘I believed I was a monster because I was abused. When I looked in the mirror, that’s what I saw.’ Eleanor Longden was allowed a brief moment to explain that she too had eventually learned to make peace with some of her most hostile voices. These were among the most powerful and moving moments that have been shown on any mental health programme. And the concluding line of the documentary was almost, almost right – ‘Psychosis is primarily the brain’s response to traumatic events.’ Replace ‘brain’ by ‘person’, put all that dopamine in its relational and social context, take a broad definition of ‘trauma’, and we’ll be there. Meanwhile, there is still a way to go. The Hearing Voices Network, for those like Rachel who are lucky enough to find it, is one of the very few places that supports non-medical understandings of extreme distress. Therapy, especially trauma-focused therapy for voice-hearers, is rarely available. Drugs are grossly over-used. Diagnostic labels routinely stigmatise the survivors of adversity. And the paedophiles of Beck Road, Hackney, have not yet been brought to justice. Nevertheless, I believe that we will look back on this programme as the moment when the biomedical public narrative finally started to change. - Reviewed by Lucy Johnstone, Clinical psychologist, author and trainer. Watch the programme now on the BBC iPlayer. As much as I thought the last 15 minutes of this programe was refreshing and valuable I was on the whole appalled at the misleading narrative which focused on brain chemistry for much of the time. A non psychologist viewer could have been forgiven for coming away from the programme completely unaware that the 'dopamine' theory of psychosis has consistently failed to produce the goods. What appeared as undisputed fact in the programme was little more than the hobby horses of a few researchers who seemed not to know that the position they were advancing has been in dispute for several decades. The BBC science output on mental health issues has been consistenly biased toward biological perspectives for some time. As this documentary failed to make clear that the biological view championed has been consistenly challenged I could only view it as an attempt to seriously mislead viewers. The program on 'ADHD' with the comedian Rory Bremner was no better - completely devoid of any critical voice and functioning as little more than propaganda for the bio-bio-bio model of mental health and well-being. As with its political coverage, the BBC's lack of impartiality is grating and here one wonders how the networks of influence between Big Pharma, the psychiatric establishment and the BBC have been set up and maintained on a long term basis.